Whether he’s running up on stage to tell everybody that Beyoncé is better than Taylor Swift, or running up on stage to tell everybody that Beyoncé is better than Beck, Kanye West always has a lot of opinions. The problem is that some people don’t like the way he presents his opinions— either because he has a tendency to yell them at people while running onto a stage, or because his opinions are just too real. See, Kanye West tells it like it is, and if you don’t like that, well, he’s sorry that you have such a problem with his opinions. Style then made the argument that some of his choices—no matter how pure his intentions are—can push audiences to “not be on his side.” Kanye referred to this suggestion as “a little bit offensive,” but he does say that audiences (especially fashion people) aren’t usually on his side anyway. Maybe that’s why he likes to make such a big show of his ideas? He doesn’t feel like people are really giving him the attention he deserves. Kanye then talked about his Adidas line a little bit more, and he ended up revealing his greatest career aspiration: He wants to be “the Steve Jobs of The Gap.” He doesn’t just mean a guy creating whatever the Gap-equivalent of an iPod is, either. He wants “full…creative control of The Gap.” Honestly, we think that’s a great idea. 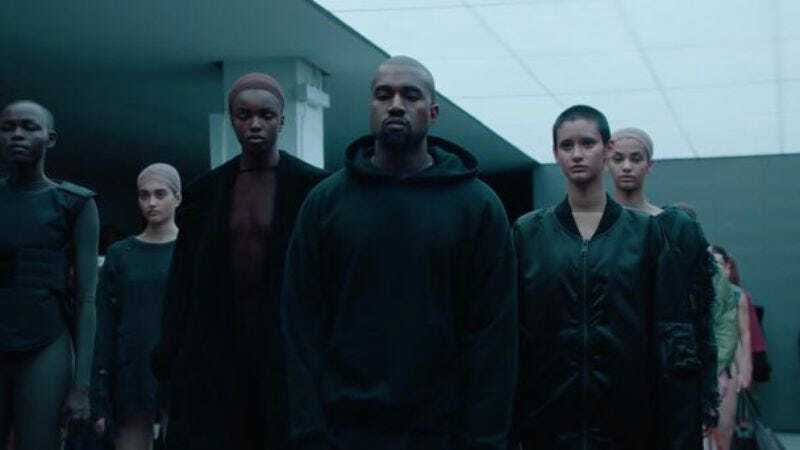 Giving Kanye West that much control over fashion is the world’s first step toward sci-fi-style jumpsuit uniforms.